The No. 3 seed in the 100 (10.06) at the NCAA East Preliminary meet, where he will also compete on the 4×100 and 4×400 relays…already a six-time, first-team All-American…100 PR of 9.96 ranks No. 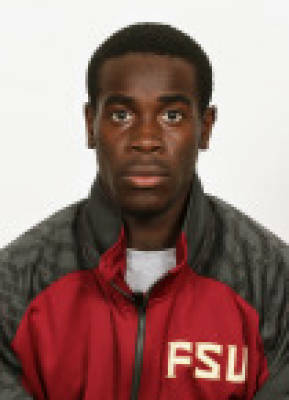 4 in FSU history…two-time ACC Outdoor Championships track MVP, helping to Seminoles to three team titles in his career. Outdoor: NCAA runner-up in the 100 with a blistering 9.91-w…on eighth-place 4×100 relay, snaring two first-team All-American honors…fastest legal time of collegiate season (9.97) came in NCAA semifinal heat…won ACC title in 100, was runner-up in 200 and anchored winning 4×100 to claim track MVP honors for the team champs…was sixth in 100 at USA Nationals and chosen for Team USA relay pool at IAAF World Championships in Moscow…stunned Diamond League field with silver at Monaco in 100 with PR (9.96), right behind Justin Gatlin. Indoor: Earned NCAA All-American honors with third-place 4×400 finish in school record (3:05.13) at nationals…ACC Championships runner-up in 60 and 200 for winning `Noles…ran No. 2 60-meter time in country (6.56) in runner-up finish to teammate Marvin Bracy at Tyson Invitational…competed for first time since 2011 after transferring from Tennessee. Earned a pair of All-American honors in 2011 at Tennessee in the 200 outdoors (eighth) and 60 indoors (fifth)…selected SEC Freshman of the year after placing second in 100 and third in 200 at conference meet…was fifth in the 200 and sixth in the 60 at SEC Indoors…starred at Chamberlain High, winning back-to-back 4A state titles 11 (2008-09) to go along with state record 200 (20.58) title in 2009…won Nike Outdoor National titles in 100-200 in 2009…completing degree in social sciences…born December 12, 1989.